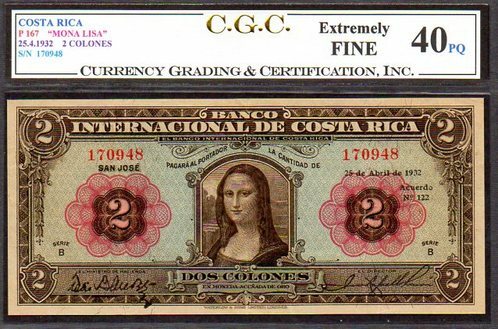 COSTA RICA P167 2 COLONES FAMED "MONA LISA" DATED 5.8.1936 2 COLONES GRADED CGC 40PQ! THIS PIECE HAS INCREDIBLE DEEP PUNCH THROUGH EMBOSSING (ESPECIALLY ON SIGNATURE, WHICH IS SEEN ON THE BACK LOWER MARGIN - BLACK LINE IS THE SIGNATURE PUNCHED THROUGH FROM THE FRONT). EXCEPTIONAL MARGINS (CENTERING) AND RAZOR SHARP CORNERS! "TOTALLY ORIGINAL" WITH VIBRANT COLORS! MONA LISA'S EXTREMELY SCARCE EVEN IN LOW GRADES, BUT OUTRIGHT RARE IN XF OR ABOVE! WE ALSO HAVE IN OUR EBAY STORE "THE ONLY" KNOWN OR REPORTED UNCIRCULATED EXAMPLE (GRADED CGC 67PQ)!!! PLEASE READ BELOW FOR INTERESTING WRITE UP ON LEONARDO DI VINCI AND MONA LISA!